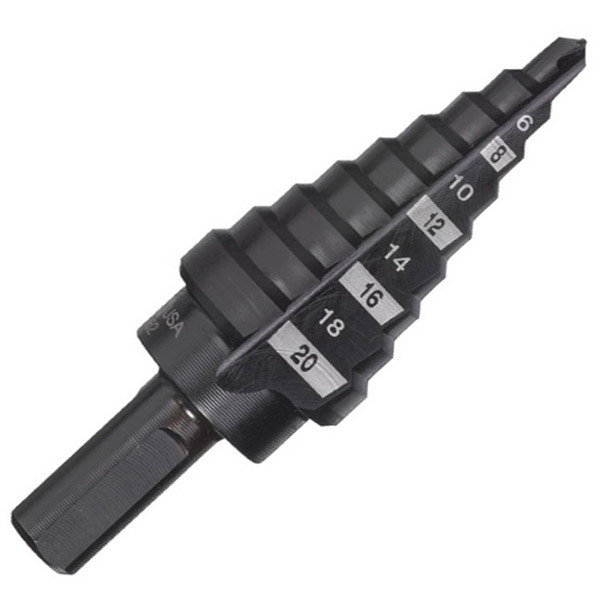 HSS ground step drill 2 – 20 mm in 2 mm steps with 3 flat secure grip end reception for maximum transmission of torque. • One drill bit to drill multiple sizes - Do more carry less! • Best option for enlarging existing holes. • More durable than twist drill bits, thick core resists breakage. • More accurate and less walking, tip starts on contact. • Clean burr free holes, less reaming required. • Drills plastic without splitting or cracking. Designed with JAM-FREE Performance for tough jobsite conditions, these Step Bits boast a smooth cutting Dual Flute Design with black oxide coating, producing greater cutting speed, less heat and extending bit life. Milwaukee has also identified common problems posed by bit walking and developed a new design aptly named Rapid Strike™ Tip to combat this, ultimately saving time and promoting greater user productivity. Step drills are ideal for drilling into the following materials: Ferrous & non-ferrous sheets metals, profiles and pipes. Copper, brass and aluminium. Stainless steel. Plastics. Maximum material thickness 4 mm. To ensure best lifetime we recommend the use of a coolant. Electrical: drilling of panels and cabinets for cable gland installation. Plumbing / HVAC: access holes for pipework and installtion. Metal workers / fabrication: various sizes and hole enlargement. Automotive: holes for cable installation (mobile telephones, antennas, re-directing electrical wiring). Maintenance repair operations: various applications, sizes and hole enlargement.